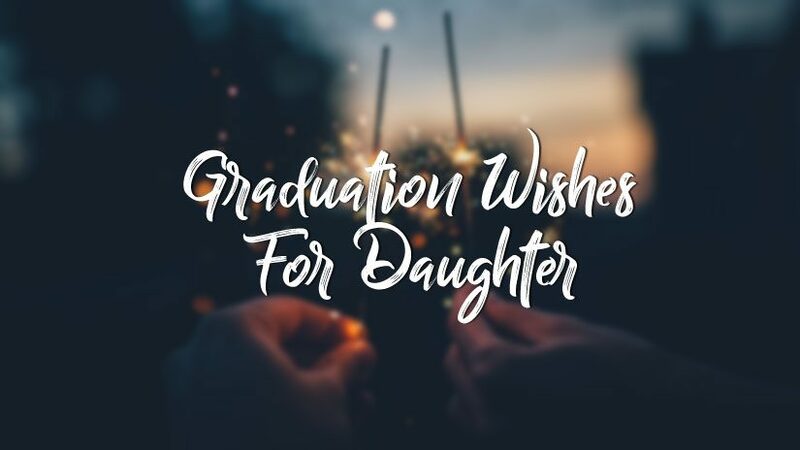 Graduation Wishes for Daughter : Graduation is the most important milestone in education. Everyone always tries to keep their parents happy by completing their graduation with an outstanding result and achieving good grades. When they become successful the happiness of their parents have no bounds. So, after their big achievement as a graduate, they deserve hearty congratulations and appreciation for their hard work and success. Every parent should congratulate their child on the very Happy Graduation Day, as it is the pay off of their hard work, attentive study, discipline, and many other performances. As a parent, you should wish and greet your daughter by graduation congratulation messages. It will inspire her for future and the new step of life. Pick the best one for congratulating your daughter! 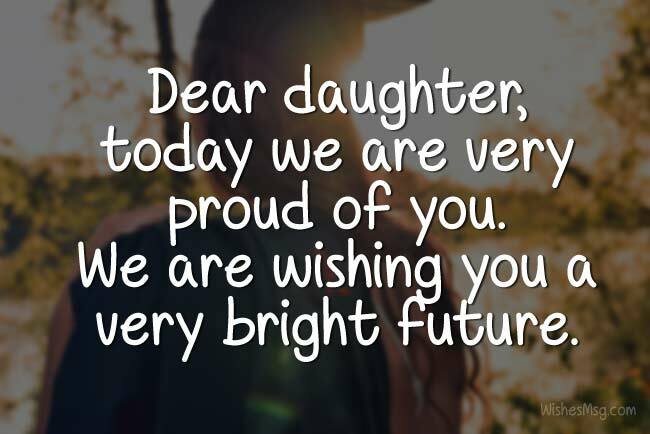 Dear daughter, today we are very proud of you. From now on, you are a graduate. We are wishing you a very bright future. Best of luck for the next step. We can remember your first day at school. Even it seems like just a few days ago. And today you have completed your graduation. Congratulations from your parents! It’s a pleasure to see our princess daughter completing her graduation! A bright future is waiting ahead for you. Wishing you a very successful journey in life. After a long journey, your hard work already paid off. You have become a graduate today. It’s a wonderful time for all of us. We love you! Congrats to our newly graduate! It was our lifelong dream to see you dressed as a graduate. Today you fulfilled our dream. We are so proud of you! Graduation means you are now fully prepared to face the real world and take your own responsibilities as well as your parents. We believe you will do this well too! Best of luck! Working hard must pay off dear! It is proved again by your outstanding result. We know you worked so hard and today get the result. Now it’s time to go ahead for the next step of your life. All the best! Congratulation my dear lovely daughter! We are feeling proud as your parent. Our daughter is grown enough to take the responsibility of her parents! Love you, sweety. Wishing you a very bright future. Dearest Daughter! Sending the message with a congratulation wishes from your mother. I’m so proud because of you. My sweet girl becomes graduate today. All the best for your next step! Your hard working get the result today. Congratulation my dear daughter! I’m proud of your success. Your mother always appreciates your decision. Praying for your continuing success. Dear sweet daughter! You are beautiful as always. But today you are a knowledgeable and beautiful woman. May God be always with you! Best wishes for your future! Today is very important for you. You have become a graduate today. You are way more than what you were yesterday. Keep believing in yourself! Go ahead with confidence and you’ll succeed. You made my dreams come true. You are the most beautiful and lovely daughter anyone can ever have. Congratulations from the deep of my heart! Dear! Graduation is the gift of yours from almighty. You working very hard, so today you get your result. Congratulation my dearest child! Your mother will always there for supporting you. Lovely daughter! I become very proud because of your success. You become graduate today. Be brave always. Wishing for your bright future! Go ahead with honesty! Best of luck! Congratulation my daughter! Don’t stop here. You need to go a long way. Keep proving you can achieve the unachievable. Keep making us proud! I always believed in my daughter. I know daughters can do everything that a son can do. You proved me right again. I love you and congratulation! Congratulations! The first thing that hit my mind after I heard of your graduation is that we really need to build a new house. I wish with all my heart that you will find a job quickly. Dearest daughter! It seems that yesterday you were a little girl but today you become a young lady. You become graduate today. It’s really like our dreams come true. Congratulation my baby! I have calculated all the money I spent on you so far. Since you are now a graduate, I want you to pay me on the monthly basis just like I did when you were the student. Just kidding! Congratulations my dear! Today is an important day for me. My little daughter becomes graduate today. As a father, I always appreciate your endeavor. It’s just the beginning. Wishing for your bright future! Congratulation for your achievement. I had never disagreed with your decision because I always trust you and today I get the result. Love you a lot my dear daughter! Today I feel that I’m the luckiest father in the world! My little daughter becomes graduate today. It is really surprising to me. Wishing for your bright future! It’s a day to celebrate only. You have proved again that supporting you in every situation was the brightest decision I ever made. Congratulation dear and know that your father loves you always. 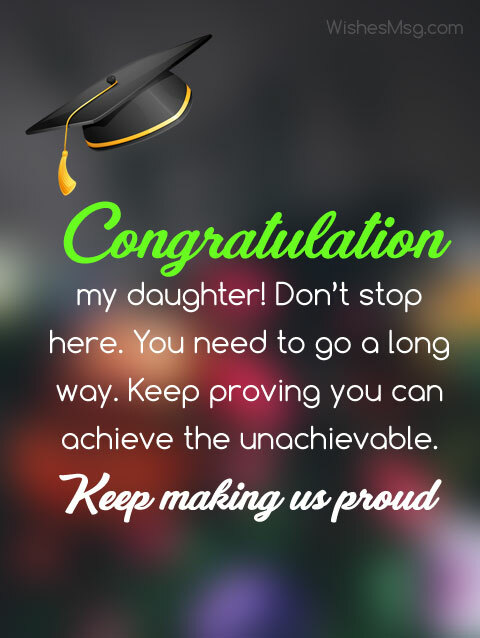 Graduation message for daughter is the perfect wording to congratulate a newly graduate daughter. This is exactly what to say to a graduating daughter. All these are happy graduation wishes that every daughter expect from their parents. 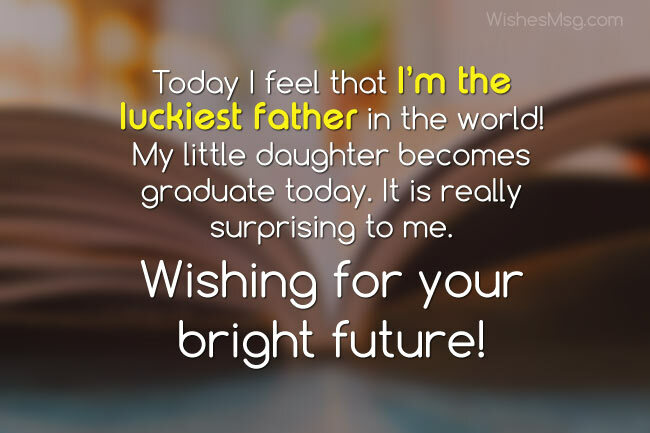 So make her feel the luckiest daughter in the world on her happy happy graduation day!